-Radical and militant Black Metal from Italy. -A mandatory atmospheric Black Metal album in the vein of the old scandivian classics, an essential release. -More musical desecration from this blasphemous Black/Death Metal cult horde. -Swedish Black Metal, no introduction needed here. -Primitive and evil Black Metal featuring Shaxul, ex-Deathspell Omega singer. -Second album after three years of silence, eight songs of big bang Black Metal, highly recommended! -Mandatory Black Metal from Mexico, highly recommended! -Elite Black Metal from Greece, recommended! -Totally cult Finnish Death/Black Metal. -Two unreleased recordings from both bands, produced by Seedstock Records. -Their surprising return, cult Black Metal from Italy. -Ethereal underground French Black Metal. -Sinister and romantic French Black Metal. -Nine tracks of French melancholic Black Metal with a strong punkish feeling. -Mandatory Swedish Black Metal, Moribund Records version. -Powerful and melancholic Black Metal full of darkened feelings. -Melancholic Heathen Black Metal from the Netherlands, highly recommended! -Dismal, morbid, primitive death worship. Raw Black Metal with keyboards. -Compilation of tracks taken from three different demos. -Defiantly astral, morbidly experimental and purely satanic Black art. -Old school Black Metal from Italy in the vein of Darkthrone's Panzerfaust and Hellhammer. -Nihilist Black Metal from France. -Raw and blasphemous Black Metal from Spain. -Accoustic recordings from Forest Grave and a long raw Black Metal track by Ostots. -Primitive and utterly raw underground Black Metal. -Militant Black Metal from Greece. -Back in stock! Cult underground Finnish Black Metal split release, Moribund Records version. -Portuguese Black Metal co-released by Herege Warfare Productions and Antihumanism Label. -A true underground Black Metal classic that is utterly mandatory, highly recommended! -Follow the voice to nowhere. -Obscure Black Metal from Portugal, full lenght album. -True Black Metal from Belgium. -One of the very few bands coming from Belgium wich plays Black Metal as it should sound like. -Russian Heathen Black Metal featuring members of Temnozor'. -Totalitarian occult black art from Germany. -Crushing underground Black Metal from France. -Raw and hateful Black Metal from Germany, released on Death Cult Records. -Mystical and raw Black Metal from Finland, recommended! -Classification is pointless for something so deformed and hopeless. -Bleak and hateful black metal from France. 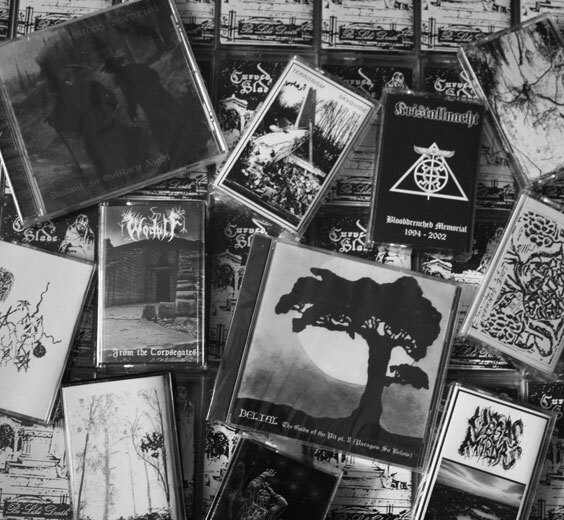 -Live recording from this Finland's infamous Black Metal horde, comes with a small poster. -Turbulent mix of fundamental elements of black, grind, death, noise, produced by Hospital Productions. -Universal Death Metal in the vein of early Hellhammer and Celtic Frost. But Sci-Fi. -Back in stock! Canada's most mysterious and captivating act meets occult Black Metal, highly recommended! -Unreleased second full-length album. Psychedelic serial killer Rock. -Cult Black Metal from France produced by Drakkar Productions. -Raw underground radical Black Metal. -Mighty Greek Black Metal extremists, highly recommended! -Their best tracks ever, more powerful, fast and extreme, includes 2 live tracks. -Their first demo for the first time on CD including the first version of Ancients (Furor Antiquus) and plus 4 songs never before released from 1994.